As one of Atlanta’s most prestiges condo towers, the St. Regis Hotel & Residences features 151 lavish hotel rooms and suites, 53 luxury condo residences, and a host of luxury lifestyle amenities that includes Georgia’s very first Remède Spa. From its timeless architecture to the building’s superb Buckhead location, it’s hard to imagine a more desirable condo building to call home, and it’s perfect for anyone appreciates the ease and convenience of a maintenance-free lifestyle, or when owning and maintaining a large single-family home or estate is no longer practical. As you’ll quickly find once browsing what’s on the market, condos for sale at St. Regis Atlanta offer unique layouts, high-end custom finishes, and spectacular views of the city, which is especially true on the building’s upper floors. Along with the Remède Spa, St. Regis Atlanta also has a sprawling outdoor Pool Piazza, over 16,800 square feet of indoor/outdoor event space, and of course a state-of-the-art fitness center for residents to enjoy as well. Concierge service and all the hotel-style services are also available to condo owners at St. Regis Atlanta, and you’ll also find several bars and cafes situated within the building also. In most instances, look for most St. Regis Atlanta condos to fall somewhere in between the $2.5 and $8 million price range. . Listed below are recently closed sales at St. Regis. Whether you’re thinking about buying or selling a condo at St. Regis, checking to see what other comparable properties have sold for in recent weeks and months provides helpful insight into current market conditions within the community. For more information about St. Regis condos for sale or for a complete list of recent condos sold in the neighborhood, contact The Zac Team today! 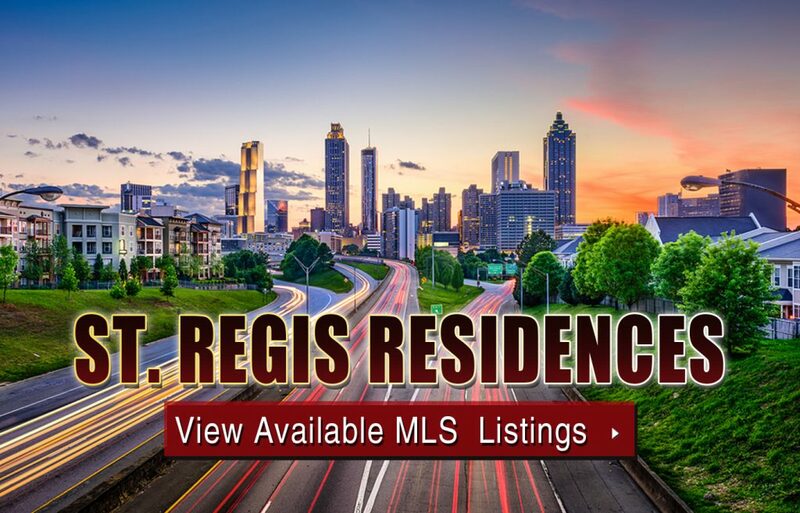 Can’t find what you’re looking for at St. Regis Atlanta condo building? Start browsing other Atlanta real estate for sale or give the Zac Team a call at 404.564.7272 for help with your new home or condo search today!